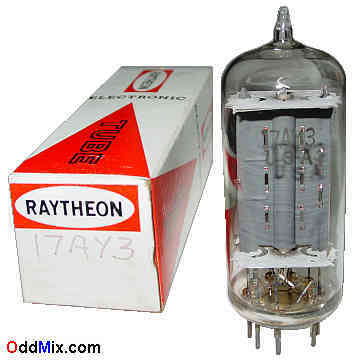 This is a genuine, original Sylvania - made for Raytheon - 17AY3 Half-Wave Vacuum Rectifier electronic vacuum tube. Developed for damper tube for horizontal-deflection oscillator circuits. May be used in many other applications. This tube is great for spare or replacement part, antique radio and television restoration, ham projects, transmitters, circuit design and development, X-Ray emitter or to set up a private vacuum tube museum. It is NOS compactron tube - New Old Stock, unused, boxed. First come first serve only one historical vacuum tube available!